George Lueddeke, PhD is author of Survival: One Health, One Planet, One Future (Routledge) released on 18 October 2018. While 193 countries agreed the SDGs in 2015 and 195 endorsed the Paris climate agreement in December 2015 (surprisingly the US withdrew from the accord in June 2017 – which could take four years to complete), it is breathtaking how members of the UN Security Council continue to frustrate UN resolutions which could address many of the issues faced globally especially given hard evidence– subverting the needs and will of those who have most to lose. Adopting shared values that underpin the UN 2030 Agenda – especially values of equality, democracy, tolerance and respect to bridge division between people and bind nations together could not be more urgent. With a Foreword by Professor David Heymann MD, the book builds on two previous books on medical education and global population health and well-being and seeks to address two of our greatest social problems: changing the way we relate to each other and to the planet and confronting how we use technology for the benefit of both humankind and the planet. Covering a wide range of issues, the book provides a point of convergence in Chapter 12 outlining Ten Propositions for Global Sustainability, which cut across all sectors and are meant for decision-making bodies – in particular the 193 national governments at the United Nations General Assembly that endorsed the SDGs in 2015 and the 15 members of the UN Security Council. BMJ Glob Health. 2018; 3(5): e001137. CELEBRATE ONE HEALTH DAY 2018! Get involved and set up your own activity to bring attention to the need for One Health interactions and collaborations. The third global One Health Day will be officially celebrated on 3 November 2018 and promises to be a memorable day for the worldwide One Health community. Groups from Australia to Brazil and from Canada to South Africa are organizing exciting events that will help raise awareness about the One Health approach, as shown on the One Health Day Events map. Anyone can initiate a One Health Day event and they can focus on any One Health-related topic that addresses the inter-connectivity of human, animal and environmental health. If you are planning an event to celebrate One Health Day 2018, it isn’t too late to register it at this link to get on the map. The Event Guidelines will help you plan and implement it. If you need more information or assistance, your regional Point of Contact spokesperson will be glad to help out. An additional benefit of registering a One Health Day event is the chance for a surprise visit by a renowned One Health leader. These surprise visitors will bring energy and excitement to the selected events by adding the weight of their One Health personality and scientific renown. One Health Day especially encourages students to set up One Health events that facilitate student delegates working together from different academic disciplines and backgrounds. In fact, student teams may enter their One Health Day events to compete for a $2,000 cash prize. Four award winning student-led events from different regions in the world will be selected by a jury of renowned international One Health experts. Check the Student Competition webpage to see if your Student Team is eligible to apply for a One Health Day Award. New One Health book available...one of the best yet! One Health is a collaborative, multisectoral, and trans-disciplinary approach — working at the local, regional, national, and global levels — with the goal of achieving optimal health outcomes recognizing the interconnection between people, animals, plants, and their shared environment. 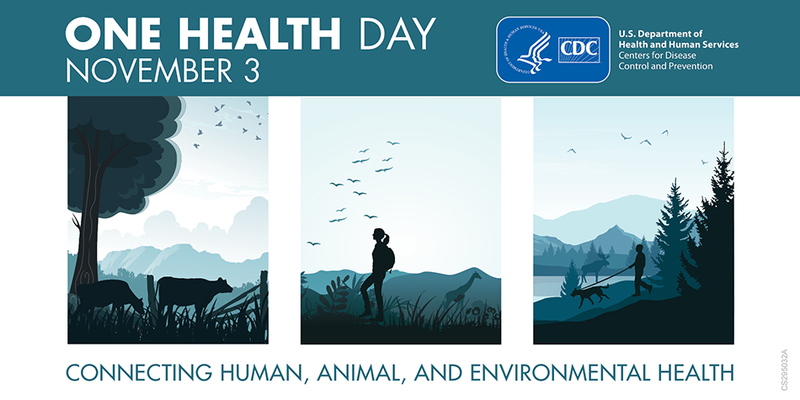 November 3, 2018, marks the third annual One Health Day, a global campaign that celebrates and brings attention to the need for a One Health approach to address shared health threats at the human-animal-environment interface. One Health Day provides an opportunity for experts and the community to join together in One Health education and awareness including sharing stories about One Health in action. Communication, coordination, and collaboration among partners working in animal, human, and environmental health as well as other relevant partners are an essential part of the One Health approach. Working together allows us to have the biggest impact on improving health for people, animals, and our shared environment. “... Prevention is key; Prevention and control of NCDs require resilient, equitable and sustainable health systems with robust primary care systems. Prevention also requires a comprehensive approach towards fighting the major risk factors causing the rise of NCDs - such as malnutrition and physical inactivity. Digital technology can increase the efficiency, accessibility and strength of our health systems and we need to maximise this potential.